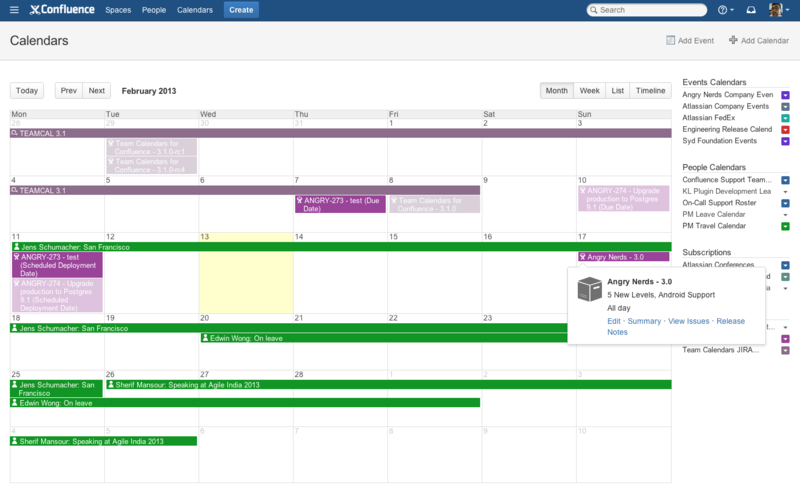 The Atlassian Team Calendars team is pleased to announce the release of Team Calendars 3.1. This release was mostly focused on making Team Calendars align with the new Atlassian styles, small improvements and support for the upcoming Confluence 5.0 release. Scrolling vertically now scrolls up/down timeline view. Previously, scrolling vertically would zoom in/out of the timeline. For those of you with lots of parallel events in your timeline view, it mean that you couldn't scroll vertically to access them. Zooming in/out is still possible using the plus and minus buttons on the view. Alternatively, download the latest release from our plugin exchange and install it via the Plugin Administration screen. This should upgrade Team Calendars to 3.1.0 (or higher). To do this in JIRA, simply click 'Upgrade' in the jira-ical-feed entry of the Plugin Administration screen. Alternatively, download the latest release from our plugin exchange and install it via the Plugin Administration screen. 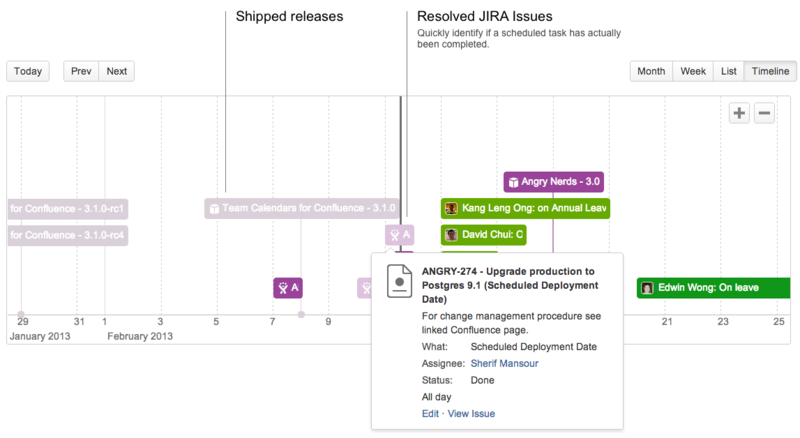 This should upgrade Team Calendars for JIRA to 1.0.12 (or higher). Note: The JIRA plugin upgrade is completely optional and not required if you are not using JIRA Calendars for Team Calendars. You can view a list of all the issues resolved here. Thank you for all your issues and votes. Keep logging issues to help us keep improving!